I love this story. It’s such a weird horror story. The Triffids obviously aren’t that scary but the circumstances make them so. 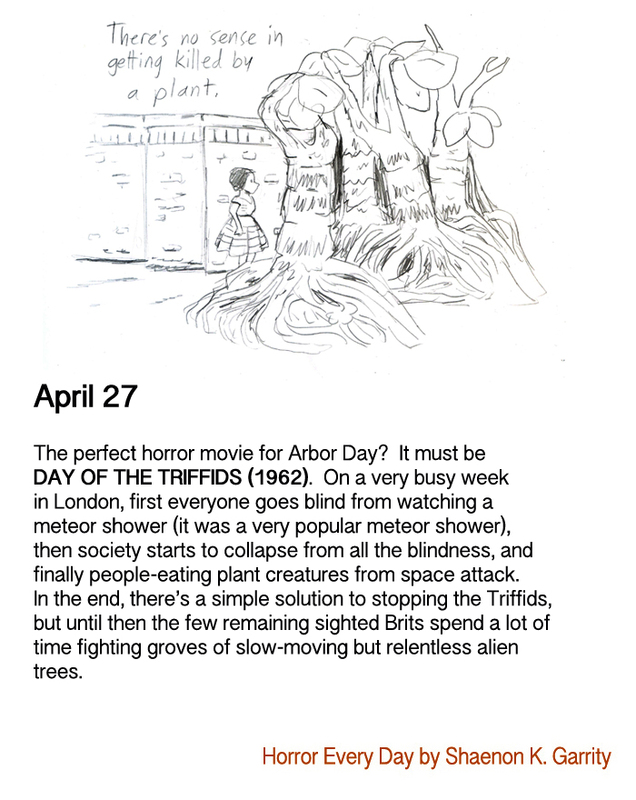 It was even weirder in the original novel, because the Triffids were actually cultivated prior to the meteor shower. No one knew exactly where they’d come from, though they could pinpoint their original seed dispersal to an exploding Soviet airplane releasing them into the atmosphere about a decade earlier. People knew what Triffids were, and they kept their stinger bits docked so that they could be safely tended for this vegetable oil they produced. The protagonist was in the hospital because he’d had a close call with a Triffid that had partially regrown its stinger and whacked him across the face. Everyone knew that they were potentially dangerous, but the tradeoffs were considered worthwhile up until the point where the balance of power suddenly shifted. It also predicts decimalized British currency twelve years before Doctor Who! My wife, however, prefers The Woods as a great Arbor Day movie. I found the bit with the blind airline pilots futilely calling for help more horrifying than anything with the plants, myself.